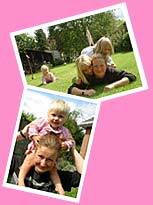 Can I Become An Au-Pair in Ireland ? You must have an EU nationality. This is in accordance with the Irish Immigration Laws. "I am a South African girl, with German nationality, who spent 6 months with the Harris family who made me feel so welcome, showing me true Irish hospitality. I had great opportunities to travel and saw a lot of Ireland and other countries including Paris and London. I had great relationships with all of the 4 children I looked after and miss them now that I am home again. I met a German au-pair there who stayed in the next town and we have become very good friends and still e-mail each other even though we're ½ round the world from each other. I was so sad to leave but alas the real world awaited. It was an experience I will never forget."